…making an incredible 14,626 of my books out there. 64 of Last Sunrise & Other Stories. 839 of Dark Soul Silenced – Part One. 537 of Dark Soul Silenced – Part Two. 404 of Wanderer – Echoes of the Past. 493 free copies of Last Sunrise & Other Stories given away. It wasn’t ever a big seller, but it is doing much better perma-free. 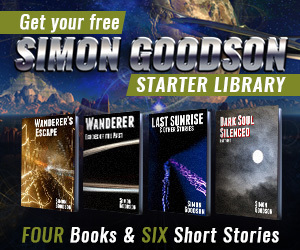 Wanderer’s Escape hit the #1 spot for free Science Fiction at Amazon.com, something that still has me grinning whenever I think of it. 7,032 copies of Wanderer’s given away in the latest 5 day promotion. 32 blog buy doxycycline 500mg posts and 1,460 spam comments in reply. 25 books sold by January, when the second book was published. So almost all sales are actually in just eight months, not twelve. 40,000 words written of book three in the Wanderer’s Odyssey series. And most importantly of all… ZERO regrets at having gone down this path. So that’s my amazing first year. I smashed through every one of my realistic targets, and pretty much all of the “Wouldn’t it be amazing if…” targets too. The reception for Wanderer – Echoes of the Past has been truly astounding. In just six weeks it has sold 368 copies and the sales are still going strong. Most of the feedback has been very positive with a couple of exceptions – but I’m quickly learning that you can’t please all the people all the time. Most importantly of all, I want to say thank you to everyone who has come on this journey with me – both those who have actively helped and those who have read and enjoyed my books. Thank you all.